Suggestion: For a party, laminate or cover with clear contact paper purchased at your local office supply store and use as placemats. The placemats can be sent home as treats. 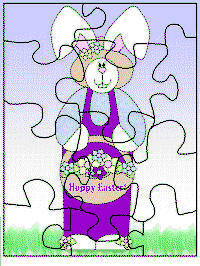 Print out the Easter puzzle. Cut out a piece of corrugated cardboard the same size as your paper (8 1/2 x 11 ish). Glue your page onto it. ADULT: using sharp scissors or exacto knife, cut out the cardboard along the puzzle template lines.